On the 18th (Thu), get great views at Gerrards Lookout. Sydney to Maleny is an approximately 7-hour combination of flight and train. You can also do a combination of flight and bus; or drive. In April, daily temperatures in Maleny can reach 30°C, while at night they dip to 19°C. Finish your sightseeing early on the 19th (Fri) so you can drive to Noosa. Get out of town with these interesting Noosa side-trips: Mooloolaba (Mooloolaba Beach & Sea Life Sunshine Coast). 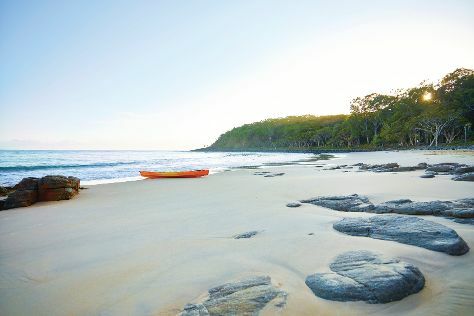 Spend the 20th (Sat) exploring nature at Noosa National Park. And it doesn't end there: tour the pleasant surroundings at Noosa Main Beach, wander the streets of Hastings Street, and hunt for treasures at The Original Eumundi Markets. For other places to visit, traveler tips, reviews, and more tourist information, use the Noosa trip app . Drive from Maleny to Noosa in 1.5 hours. Alternatively, you can take a bus; or take a train. Wrap up your sightseeing on the 22nd (Mon) early enough to travel back home.